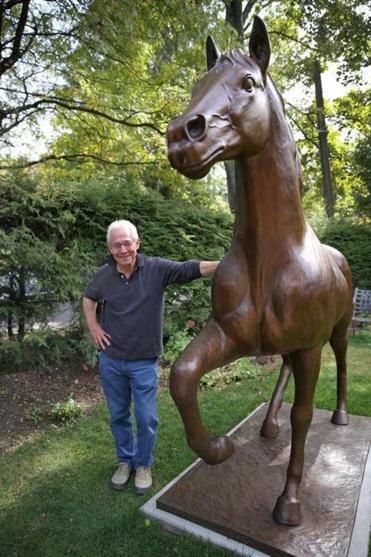 Robert Gaynor has always loved horses, and his sculpture Flashy Bull is a reflection of that. NEWTON — A horse is a horse, of course, of course. But Robert Gaynor’s steed is something else. Named Flashy Bull, this handsome thoroughbred stands 8 feet high and 11 feet long from nose to tail. It weighs a ton. And, despite the raised hoof and flared tail, it never moves. Gaynor, 73, a retired attorney, created the bronze sculpture, which sits behind the hedge in his yard on a quiet corner not far off Centre Street in Newton. Lots of people, of course, take up a hobby in retirement, and some produce beautiful works of art. But not like this. “It’s very rare to see someone make something of this size just for his own benefit,” says Gaynor’s friend Robert Shure of Skylight Studios Inc. in Woburn. He has put years of work and an amount of money he doesn’t care to reveal into a hobby he says has its origins in his high school years at the private Belmont Hill School. While there, he — like all seniors — carved a small wooden relief, in his case a likeness of his then-pet boxer, Rex. As retirement approached, he picked up where he left off. 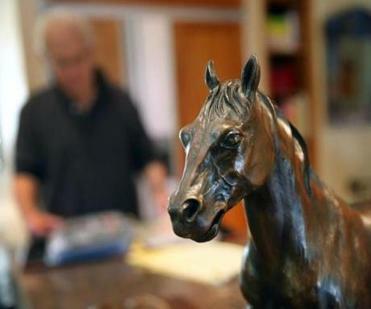 He has spent much of the last decade shaping clay, first into a statue of another boxer, then reliefs of friends and family, and now the thoroughbred. His inspiration: He once owned a small share of the real-life Flashy Bull, who ran in the 2006 Kentucky Derby. Bob Gaynor has made smaller models of the horse. Flashy Bull’s installation, in September, required a truck, a crane, and a different kind of harness. But first there was “a little brouhaha” about its placement, said Gaynor’s wife, Lynne. “He wanted it facing the street,” she said. “Lynne didn’t want to look at the rear end,” he said. The bronze horse faces the house. They both laugh about it now. On a recent afternoon, Gaynor’s neighbor Lauri Meizler was having a small business meeting at her house and brought her three colleagues over to see the sculpture. Gaynor grew up in Newton — just across the street, he said, in the house that is now Meizler’s — and followed his father’s footsteps into the law. He worked for 42 years primarily as an immigration attorney, helping people get green cards and citizenship. Among those he had helped was a studio employee Shure brought to him. Gaynor and Shure hit it off, and eventually Gaynor decided to accept Shure’s offer to help him get started. Gaynor began with a representation of Axel, a 70-plus-pound boxer that was with the family for 14 years. “He was a good guy,” said Gaynor. That took five years of Saturdays and was completed not long before the real Axel passed away. Now the bronze Axel sits patiently in a sitting room in the Gaynor home, wearing the real dog’s collar. The Gaynors’ latest boxer, a recent arrival named Archie, pads around the room oblivious of his predecessor. Gaynor said he has always loved horses, too, and had clients among the jockeys at Suffolk Downs. In 2005, a friend persuaded him to go in on buying a race horse, Flashy Bull. Gaynor invested a few thousand dollars for a 1 percent stake, or “an ear,” as he puts it. Flashy Bull made it all the way to the Kentucky Derby in 2006, but finished 14th and was put out to stud not long thereafter. The Gaynors spent more on their Derby trip than they got out of the horse, he said, but they had a lot of fun. Gaynor retired in 2008, and finished Axel not long after. Then he decided to immortalize Flashy Bull in bronze. “I think it’s simply spectacular,” neighbor Lauri Meizler said of Flashy Bull’s details, which include the nails on his shoes. Few people work in bronze this way anymore here, although it’s more common in Western art, Shure said. The process is an arduous one, beginning with a wire and wood armature bulked out with plaster, over which the clay is layered. Shure typically takes months to complete a commission. For Gaynor, it was more than a year and a half of hitting the studio an average of four days a week. He would show off each bit of progress to Shure or one of his staff, and often as not they would tell him, “Do it over,” he said. The worst part was when his carefully wrought clay sculpture was finally made into a mold, then sectioned for the journey to the foundry in Utah. “That was traumatic,” Gaynor admitted, the notion of all that work being cut to pieces and put on a truck. Standing by the sculpture, just off his patio, he points out details like the racing shoes on the horse, with their different nailing. Two smaller bronze horses, preparatory studies, rest under cover in the basement; he hopes their two sons will each want one someday. He has given away a few of his bronzes, but he hasn’t sold one yet and hasn’t tried very hard. “He’s following his dream, which everybody should do,” said Shure. Gaynor is a man often gripped by enthusiasms. “I’m not all there,” he said cheerfully. The basement of the house contains shelves of 1950s radios, saddles given to him by grateful clients, a rack of baseball bats bearing names like Yastrzemski and Mantle. He’s working on a bust of his father now, but his next large bronze, already in the planning stages, will be a sports figure, although he’s not saying who. In the meantime, Flashy Bull requires grooming, albeit a different kind than his real-life model. 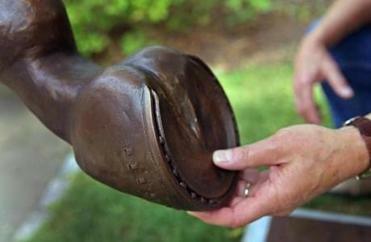 “He has to be waxed once a year because of acid rain,” Gaynor said.